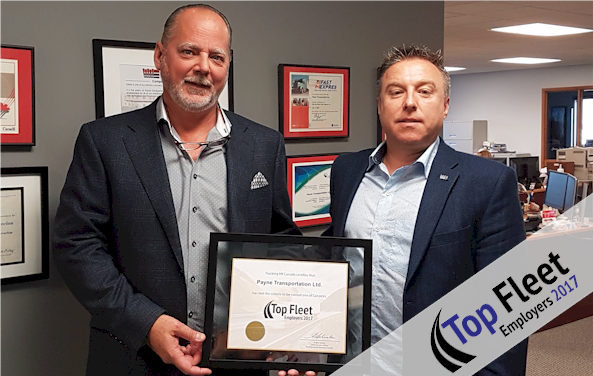 News Archives - Payne Transportation Ltd.
Payne Transportation Ltd. has been named 2 years in a row as a Top Fleet Employer. 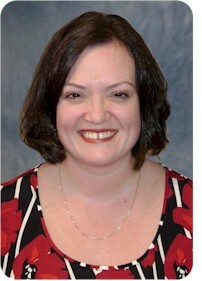 Payne Transportation is pleased to announce that our VP of Finance, Pauline Wiebe Peters, who has been a board member of the Manitoba Trucking Association (MTA) for the past 6 years has recently been elected as the only female currently serving on the MTA’s Executive Committee. The Board of Directors sets policy for the MTA and the Executive Committee is a sub-committee of the Board that oversees the staffing and financial operations of the MTA. 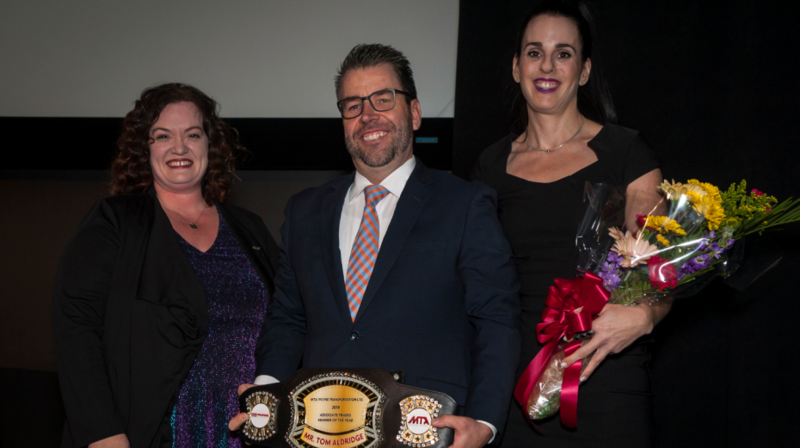 As members of the MTA, we are incredibly proud of Pauline for her dedication to the industry and the steps she is taking to promote women in leadership roles in the trucking industry. Those who are elected to the MTA Executive Committee often become a President of the MTA and serve a two year term. 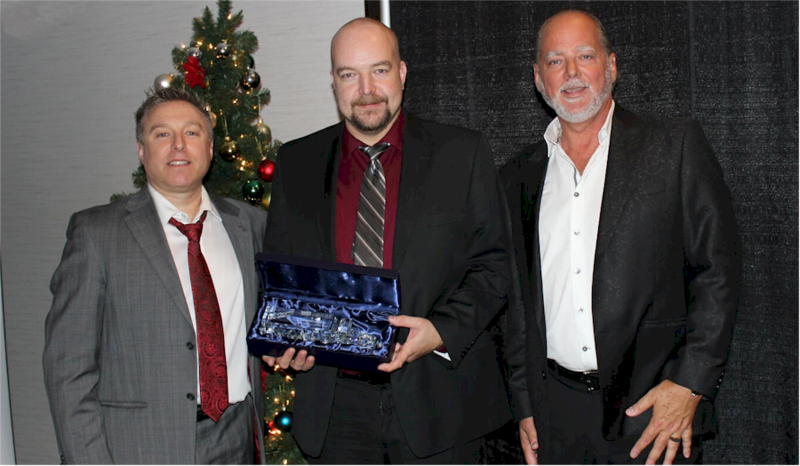 Payne Transportation Ltd. celebrates safety, service and a passion to give back at annual awards gala. 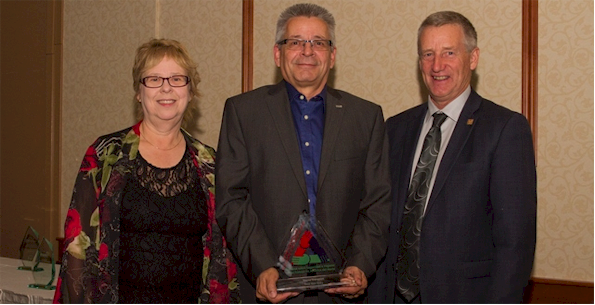 Payne Transportation employees came together on Friday November 24 to celebrate the achievements of another year in business at their annual awards dinner and dance at the Hilton Hotel in Winnipeg. The event was attended by over 160 of Payne’s drivers, mechanics, and office staff to celebrate those who have committed to making safety and service a priority and to recognize individuals who are celebrating milestone employment anniversaries. The highlight of the gala, was the announcement of the Payne Transportation driver of the year. 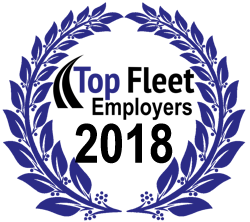 The selection process for the driver of the year involves being nominated by the operations team, vetted by the safety department to ensure they qualify, and then voted on by the Executive Advisory Committee. The finalists were announced and recognized at the awards gala, They are:, Patrik Anias, Dilpreet Bilkhu, Jean Paul Friesen, Jake & Darlene Hiebert (team drivers), Iain Iverson, Dan & Linda La Fond (team drivers) Efim Lanstein, Isaac Letkeman and Alex Melnik. 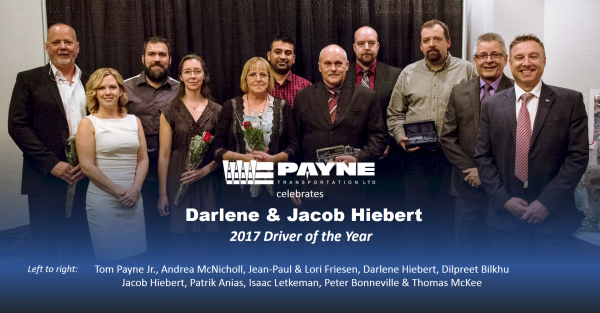 Out of this group of nominees Jake and Darlene Hiebert were chosen as the 2017 Payne Transportation driver(s) of the year. The annual celebration also included a silent auction to raise funds for Siloam Mission, a local organization that alleviates hardships and provides opportunities for change for those affected by homelessness. 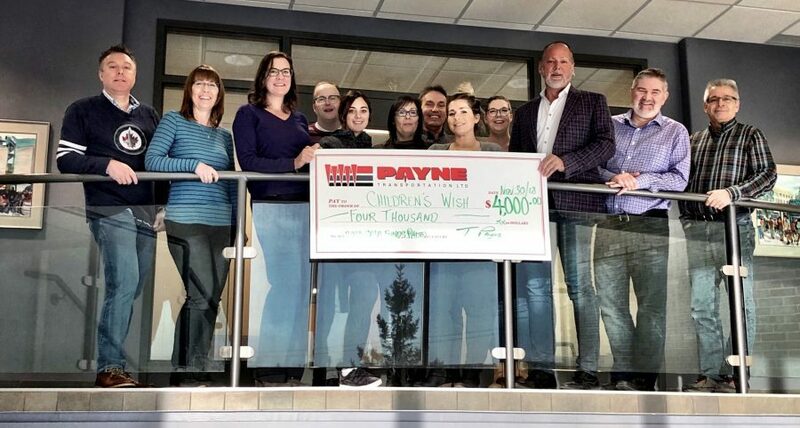 For the past 3 years Payne has been able to raise $7,500 toward the organization through this auction and this year was able to raise another $5,000 to add to that total. “Our annual gala is a celebration of our drivers and staff to recognize them for their innovation, service and leadership, but we also work toward celebrating change for the better to help improve the quality of life in the communities in which we operate” says Payne Transportation President Tom Payne. Items for the silent auction are donated by Payne Transportation’s customers, vendors and suppliers. Kel-West Carriers Ltd. becomes part of Payne Transportation Ltd.
We are excited to share the news that Kel-West Carriers Ltd. has become part of the Mullen Group of companies effective February 1st, 2017. 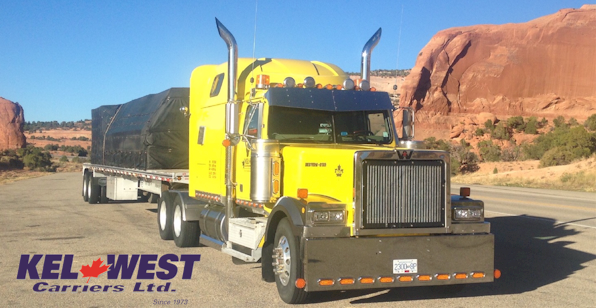 Kel-West Carriers Ltd. will be a division of Payne Transportation Ltd.
Kel-West Carriers is an international cross border flatbed carrier operating for over 42 years. They have 23 Owner Operators and approximately 10 full time employees. The decision to have Kel-West operate as part of Payne Transportation was due to the symmetries of both carriers operating as primarily an owner operator based organization. “The addition of Kel-West gives us the opportunity to expand into the BC market with an existing solid brand. “Said Tom Payne, President of Payne Transportation. “After meeting the team at Kel-West, we quickly saw they are a company that shares our values and brings to the table a knowledgeable staff from which we can learn and grow, they will be a great addition to our team” adds Payne.